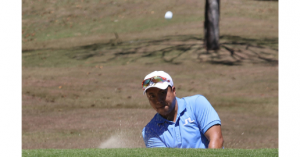 Cebu City – Philippine Airlines Interclub mainstays Jorge Martinez and Chris Tan wound-up with better cards yesterday to boost Rancho Palos Verdes-1 to fifth spot in the Founders Class played yesterday at the Mactan Island Golf and Country Club. Martinez and Tan each had 25 points as RPV-1 finished with 92 on the third day for its team total 286 points after previous rounds of 101 and 93. RPV-1 also had 20 points from Jose Addy Briones and 22 from Jean Paul Marfori. Leo Magno’s 12 did not count. RPV-1 as of press time trails Club Filipino Inc. (112-92-95-299), Eagle Ridge (98-105-94-297), Villamor Air Base (106-83-104-293) and Alta Vista (103-97-92-292) at first to fourth place, in that order going to the last day of play, Saturday at the Cebu and Country Club. Sister team RPV-2 is at 12th place of the 20-team roster with 260 points noting an 84-point performance yesterday. Oscar Rebosura led with 24 points backed by eam captain Gamirin Jerico Bajo (21), Alejandro So (20) and Regino Capa (19). Meanwhile, Davao City Golf Club is on top of the team standings for the Friendship Class, still as of presstime with a total of 223 points on a 66-80-77 three-day count. Its 77-point total came from Ian Dagatan (21), Ryan James Guiang (19), Russel Mon Salazar (19) and Alro Paglinawan (18). 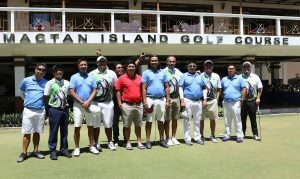 Trailing them onto the last day of competition are South Cotabato Golf and Country Club (71-78-65-214) and Iligan Golf (73-69-64-206).